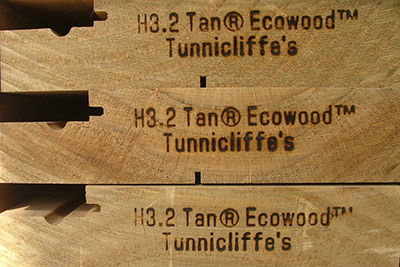 At Tunnicliffe’s we produce untreated, chemical preservative treated and thermally modified timber products. Preservative treated products are protected against fungal decay and insect attack, where the timber is exposed to the weather and or where the product has to comply with specific building regulation standards. Tan®E treated exterior timber joinery and bee woodware products manufactured by Tunnicliffe’s are a range of preservative treated wood products incorporating Tanalith® E preservative from Lonza Wood Protection. The treatment level is meeting Hazard Classification H3.2 (above ground) according to NZS 3640:2003. For more information on Tanalith® E preservative click here. This is an organic solvent based treatment system more commonly known as Light Organic Solvent Preservative (LOSP). With this treatment we are bringing the treatment level up to Hazard Class H3.1 (above ground) according to NZS 3640:2003, which is mainly applied to our window reveal products used by our aluminium joinery customers. For more information on Vacsol® Azure click here.